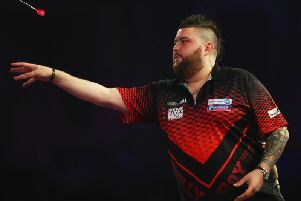 Michael Smith picked up his first win in the Betway Premier Darts League, beating five-times world champion Raymond van Barneveld 7-5 at Exeter. “It means the world to me to get the win and I can relax now,” said St Helens-born Smith. “When I was 5-4 down I had nothing to lose and I wanted to throw everything I could into the final few legs. “All the way through I felt I could win, and when I hit the 180 and 90 finish to go five-all I knew I'd win. I'm not the player to give up and roll over and I never stop fighting. The 2009 Premier League champion, James Wade, bounced back from two straight losses with a 7-4 win over Smith's fellow St Helens compatriot. Dave Chisnall, with the left-hander taking out 121, 161 and 102 on his way to a third victory of the season. “I'm really happy to win," said Wade. “I didn't think I played as well as I did - I've played far better than that in some games and lost, so maybe I was due a win like that. The Betway Premier League continues next Thursday at the Motorpoint Arena in Nottingham, which include's Michael van Gerwen's meeting with Chisnall and the master-versus-pupil meeting between Gary Anderson and his protege, Smith.